Electronic sounds have set new challenges and frontiers to contemporary music. It is increasingly difficult to classify artists within a specific genre like Son, Rock, Rumba, Samba, Symphonic music, Jazz, Flamenco and others. Today, rhythms are fused to express ideas. Additionally, the advent of the new technologies of information and communications has made it possible for more artists to have an influence from cultures alien to their traditional values. Consequently, the fusion itself does not allow an easy identification of the country or region where a piece of music comes from. We talked about all this with DJ Jorge E. Peña. He and Dayron Cardona make up the Arquitecto vs GreeCH Duo. Peña claims that a closer look at the world of electronic music reveals that certain European musicians use elements from Brazilian music or Caribbean tones for their tunes or vice versa. This makes it hard to classify certain artists, if rigid traditional classifications are followed. He continues to say that for a piece of electronic music to be Cuban, it does not have to include necessarily elements of traditional or Afro-Cuban music; “the music is rather made in the high temperatures of Cuba together with the computers and softwares that we can get. That will be enough to assert whether a certain product has been made in the Island”. 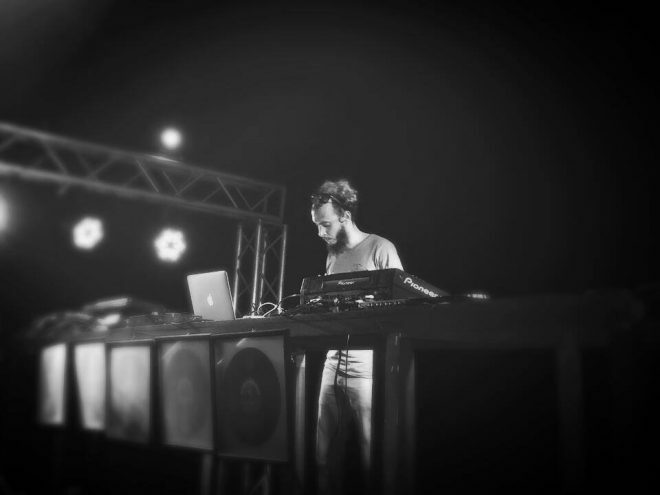 DJ GreenCH remarks that doing an electronic music concert in Cuba is very difficult because there are no conditions yet (including both open outdoor spaces or theaters) to guarantee international standards for the concert. Jorge Peña studied classical guitar at the Manuel Saumell Elementary School. “I was restless and then I failed all subjects and I had to leave the school. At that time I preferred to play games with my friends out in the street”. “My real encounter with electronic music occurred when a friend gave me the version of Fruity Loops 5 and I liked to generate music using a computer. First, I had an old computer, as a hobby for three years. Later I met Dayron Cardona. He had been a Hip Hop and Rap musician and I had some influence from Rock and Jazz, and we started to compose together”, says GreeCh. “One thing I always remember is my first public performance. It was a unique experience because one gets nervous, and at the same time you see people moving and listening to your music”. When asked about the origin of Arquitecto vs GreenCh, Jorge recalls that an exhibit was being prepared in Factoría Habana, in the Old Havana, and they were invited to play some music in this location. As they were making promotion of this event at a radio station, they were asked about the name of the duo and they joked about it and replied “Architect vs Green Chícharo”. These young musicians are now part of the Laboratorio de Música Electroacústica de Cuba and they have participated with other DJ´s in some concerts and gatherings that are promoted by this organization. For Jorge Peña, his musical relationship with Dayron Cardona has been like “a challenging trip because we started off with some tunes just for listening, New Age, but we have changed now and we have widened our spectrum and have now included tunes for dancing”. For GreeCh, the work in the duo has been important, but each member has also felt the need to work solo. Jorge had a nomination to Cubadisco 2014, the most important Cuban music award, for his CD “Lost in Discópolis”. It was undoubtedly an important moment in his career, because the jury were young musicians like him who share the same aesthetical proposals. It was enriching for him because the public who enjoy electronic music knew him. At the same time, this was an outstanding recognition in his area of creation. According to Jorge Peña, one of the conflicts Cuban DJ´s have these days is “to achieve the minimal technical requirements so that music sounds good. In other countries, when the master recording and the mix are done, they use a sound engineer and a recording studio. We, on our part, have had to learn as we do things, but I believe that we are getting to that international level or standard”. “However, the biggest difficulty we have at present is information access in the Internet. When someone has an idea, the best way to implement it is by getting to know what others have done and what they suggest that you do. Additionally, one has to listen to a lot of music. It is necessary to listen to new tunes every day, those that are of your interest and those that are not”, -Peña says. This young Cuban artists adds “- Yes, the lack of information is something we are trying to overcome in Cuba. Consider the public that comes to electronic music concerts, almost everything they consume is the most commercial type of music. These people just don`t know that there are other trends and interests. As a result, when a Cuban DJ wishes to propose his own ideas, he is not always accepted or understood-“. Independent Record Companies for Cuban DJ´s? If you ask about the visibility of Cuban electronic music in the world, I would say that it is too little. Unless you have a digital platform that supports you and contacts with the best production companies in this genre in the world, nobody will be able to listen to what you do or invite you to their festivals. I hope this situation will change gradually. These days we can see musicians from other countries coming to play in Cuba, and Cubans are participating in the international market too”.